Community Safety Minister Annabelle Ewing announcing funding for rural fire and rescue appliances back in June 2018. A 4X4 vehicle fully equipped for emergency situations including support for an on-land water rescue has been placed in the retained fire station in Fort William, and crew members have been trained to use it. It is understood it is only one of two units that have been placed in retained units. The vehicle can be used by fully trained fire fighters to assist in incidents such as a shore-side rescue of an over turned boat, an incident where vehicles have gone into a loch, or to be used while searching for missing people on the shore side. The water unit is part of a £7 million investment in new appliances for Scotland’s most rural communities, unveiled at the SFRS’ research and development hub in Portlethen in June 2018. Rab Middlemiss is the Local Senior Officer for the Highland, he said: “This is the latest example of our continued commitment to protecting the communities of the Highland area and beyond. 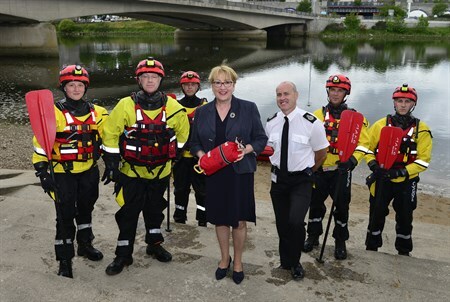 “We have trained and equipped these firefighters to the same standard as our 21 other water rescue units across the country to ensure that they can respond to some of the most dynamic and challenging incidents. Storm Frank ran through the Aberdeenshire village in 2015, devastating homes and businesses. “We absolutely have to prepare for increasing instances of extreme weather-related flooding in order to respond quickly to protect Scotland’s communities. “Bringing these new skills into the area is the culmination of some serious planning, hard work and training.